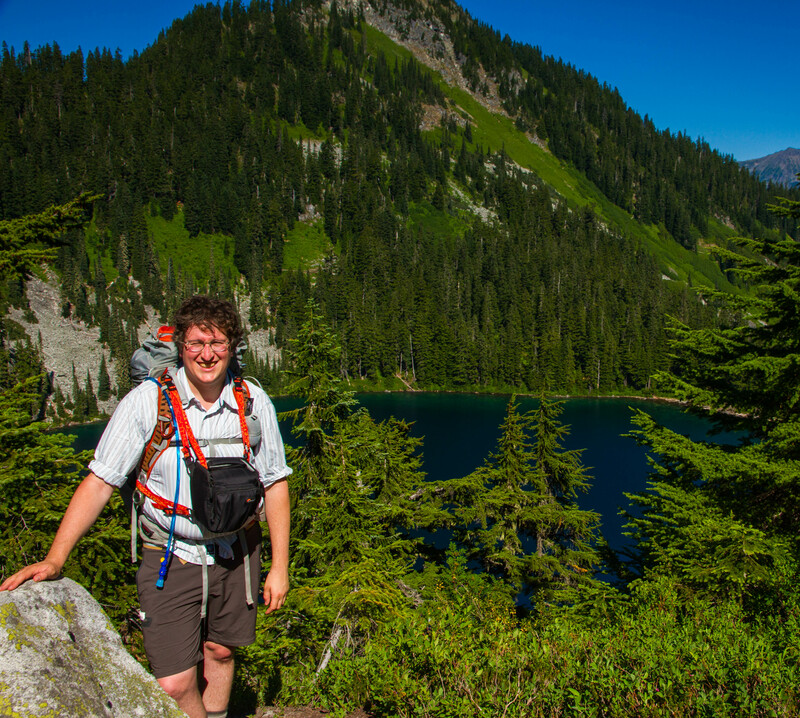 One of the most common questions I’m asked is about hiking with a camera. What do I bring? How much does it weigh? And how do I carry it? The short answer is, it depends, but let me take a bit to explain how I carry my camera in different situations. I know what you’re thinking: what philosophy could there be behind carrying a camera? Well, there are a few core concepts that any hiker should keep in mind when preparing for a journey with their camera. This may go without saying for many of you, but often we carry way more camera gear than we truly need or will be happy with. When I go hiking, my biggest decision is whether to bring my large and heavy EF 70-300mm f/4-5.6L, my lighter EF 70-200mm f/4L, or no second lens at all. I love wildlife photography, and on many trips I encounter some exciting animals to shoot, but there are many trips where I travel with only one lens, and am happier for it. This is a critical rule to hiking with a camera. If you can’t get to it quickly, without having to take off your backpack, then you might as well leave it behind. I find most of the shots where I need to grab my telephoto lens happen while I’m on the trail. By the time I take off my pack and dig through it to grab a telephoto lens hidden there, the shot is long gone. The same is obviously true of your camera itself. If you won’t carry your big DSLR within arm’s reach, then pack a small point and shoot instead. There are some amazing point and shoot cameras out there these days that will capture the majority of shots you might take during your hike about as well as a DSLR. Many of the good shots I take were being something other than the plain UV filter that is on my lens. When I go hiking, I have polarizing filters to block burned out reflections, ND filters to reduce light for slowing down moving water, and Graduated ND filters to balance bright skies with dark foregrounds or dark skies with light foregrounds. Filters allow me to take shots that would not normally be possible. A handful of filters weighs less than a lens, but extends your shooting options far more than any single lens will. Power is always a challenge when hiking with a camera. I’ve researched off-grid charging options until I was blue in the face, but the simple fact remains, unless you are planning on being on the trail almost indefinitely, having multiple batteries is almost always the better way to go for power. The one exception is if your camera can be charged via USB. If it can, you are in luck, and there are a lot of power pack options out there for you. But as a DSLR users, that’s not the case for me. But one of my batteries usually takes over 1000 photos the way I shoot, and bringing just three batteries, at a couple of ounces a piece, usually lasts me for up to a week. That being said, I always bring more than I think I might need. I can’t tell you how many times I’ve found myself with a camera battery that I forgot to charge or, even worse, gotten to the trailhead and realized I had no charged camera batteries with me. Don’t forget your batteries! Enough preamble, let’s get on to what camera gear I carry out with me. I give you this list with a word of warning. 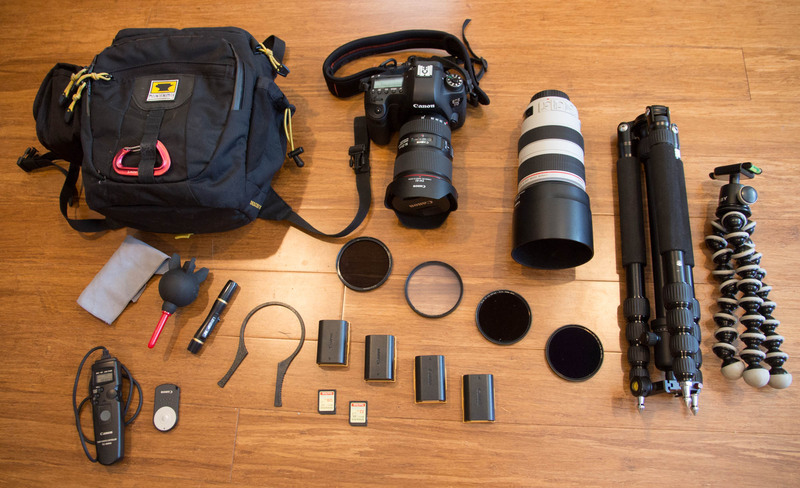 Getting more gear is not going to make your photographs better. First, you need to know how to use the gear. And second, the best camera is the camera you have. And for a hiker, that means in hand. What I bring varies depending on the type of trip. I’ll start with a complete list of all of my gear, and my explanation behind its use and rationale for why I bring it, then tell you a little about specific types of trips. Canon EOS SL1 14 oz This is, at the time of writing, the lightest DSLR body that exists. It is also the reason I’ve never gone to mirrorless. (At least not fully, I admit to owning a Canon EOS M for truly lightweight photography.) Every mirrorless setup I look at with the same quality glass costs thousands of dollars and weighs 1/2–1 lb less. When light is my game, this camera does the trick. Additionally, the APS-C sensor gives this camera and effective 1.6x increase in reach, which makes my telephoto lens much more useful. Canon EF-S 15-85mm f/3.5-5.6 IS USM 1 lb, 4 oz This is my staple APS-C lens no matter what trip I’m on. It has a great range, it take phenomenal shots with its UD lens element, it has fast and quiet autofocus with USM, it has image stabilization for pushing the handholding conditions, and no lens I’ve used has ever done better with flare than this one. It’s the perfect outdoor companion, and probably the lightest general purpose lens of its class. Canon EOS 6D 1 lb, 16 oz My move to full frame cameras was a long time coming. And thanks to the release of the cheaper 6D, I was able to make the move sooner. Lighter than the other pro bodies, this is a perfect hiking camera. Although heavier than the SL1, this camera is in league with the 60D and 70D. And the image quality bump is worth the weight. The 6D has some other advantages over my lighter SL1: better autofocus for subjects that move quickly (though not a true action performer like the 7D or 5D), custom functions for quicker switching between action waterfall and landscapes, and two dials for faster changing of exposure. Canon EF 16-35mm f/4 IS USM 1 lb, 6 oz This is my staple full frame lens. It weighs about the same as the 15-85, but has a wider angle. When paired with one of the zoom lenses below, it makes a killer combination. It’s sharpness and image quality at all focal lengths is beyond this world. It is by far my favorite lens of them all, and it’s the perfect landscape lens, which is my primary subject in the wilderness. Canon EF 70-200mm f/4L USM 1 lb, 11 oz This is a great, lightweight telephoto lens. It’s range is good for many wildlife shots, though a little short if the wildlife is particular skittish or dangerous. Would I like the version with IS? Yes, but this is my “budget” lens so I got it without. Canon EF 1.4x II Extender 8 oz This extender gives the 70-200 the range it needs for some better wildlife shots. And the two combined are still about a pound lighter than the 70-300. Canon EF 70-300mm f/4-5.6L IS USM 2 lbs, 5 oz This lens has an amazing range for wildlife photography, especially on an APS-C body. It has excellent picture quality, and many of the same traits as my general purpose lens. It also weighs 2.5 pounds. It’s probably at the far edge of what is realistic to carry in the backcountry, although I have my eye on the redesigned 100-400mm lens that was recently released. Extra batteries varies I always carry three, it’s a good safe number, unless I plan to be out longer than 6 days. My general rule is half a battery a day. Can I shoot more than that? Yes. But I try not to, and often shoot less than that. I’ve had a single battery last me through a 4-day trip before, though that’s not common. Kata Designs Camera Strap PL 3 oz This breakaway strap allows me to connect my camera directly to my backpack (more on that in the next section) or to a standard camera strap. B+W Circular Polarizer Filter MRC 2 oz Circular polarizers are an amazing tool for outdoor photography. I can’t tell you how many leaves I’ve given a deeper green by cutting out the reflective glare from their shiny surface. Or how many times I’ve taken what would be an overexposed shot of a sunny, snow-covered landscape, and given it depth. The Multi-Resistant Coating (MRC) gives it some extra durability for my backcountry use. Neutral Density Filter 2 oz Neutral Density (ND) filters are a versatile tool. Then come in a variety of darknesses ranging from a third of a stop to ten stops. They can also come with variable stops, although such filters are much more expensive. ND filters reduce the light that will get through, allowing you to achieve slower focal ranges on bright days. This is especially useful when trying to stop the action on a waterfall or open the aperture on a bright day for a blurred background. B+W Graduated ND Filter 2 oz This is what you need when the contrast above the horizon and below the horizon are outside the dynamic range of your camera’s sensor. A graduated filter lets less light through on one side than the other, and gradually stops along the radius of the lens. Filter Wrench < 1 oz If you carry multiple filters, you also run the risk of getting a filter stuck. Filter wrenches weigh next to nothing, and for that one time when your ND filter gets stuck on your lens, it will be well worth it. Filter cases varies If you bring multiple filters, you need a way to protect them. I have a variety of filter cases depending on how many I plan to bring. Lowepro has a nice 3-filter case that clips on to most bags. Tamrac makes a 5-filter case that I’ve rigged to attach to my larger overnight chest pack. And I also have a couple neoprene double filter cases in case I need room for extras. GorillaPod 13.5 oz If you are carrying ND filters, you need something to keep your camera stable for those timed exposures. On many occasion, I’ve found rocks that propped my camera as close to level as possible, and corrected in post processing, but nothing beats a tripod when you can spare the weight. I have found the light GorillaPod to be the perfect backcountry support. It cleverly grips around awkward rocks, and it’s lighter than a full-blown tripod. Remote Shutter Release 3 oz If you are planning on timed exposures, a remote shutter release can be well worth the weight. Although you can get away with 2-second timed release shots, a remote release makes life much easier and allows you to get the shot when you want it. Cleaning Kit 6 oz With the backcountry comes dirt, so having a good cleaning kit is critical. For me, this consists of a Lenspen (infinitely useful for most cleaning jobs), a Giottos Rocket Blaster, and a microfiber cloth. Extra Memory Cards < 1 oz In the age of massive memory, this is rarely a true necessity, but I generally always bring at least one extra memory card. They are small and light, yes even Compact Flash, and memory can go bad, so having a backup is always good. LowePro PhotoSport 200 AW 2 lbs, 14 oz This is my day hiking bag. It strikes the balance between space for camera gear and space for trail gear. Although the camera compartment is a bit tight with my telephoto lenses and my Canon 7D, I’ve always gotten it to fit, and I haven’t yet found anything better … yet. Lowepro Toploader 55 15 oz This is the bag I carry on overnights where I’m only bring one lens. It’s light, and doesn’t get in my way too much. That’s important when it’s sitting on your chest (see more in the next section). Mountainsmith Descent (old model) 1 lb, 15 oz When I’m bringing my telephoto lens with my on a backpacking trip, I carry this. It’s an older Mountainsmith design, and its exact match no longer exists (the new Descent is a sling rather than a chest pack). I used to carry a larger LowePro Toploader with a lens case attached, but found that hung awkwardly off-balance on my chest. Enter the Mountainsmith, which hangs evenly and fits all my gear. 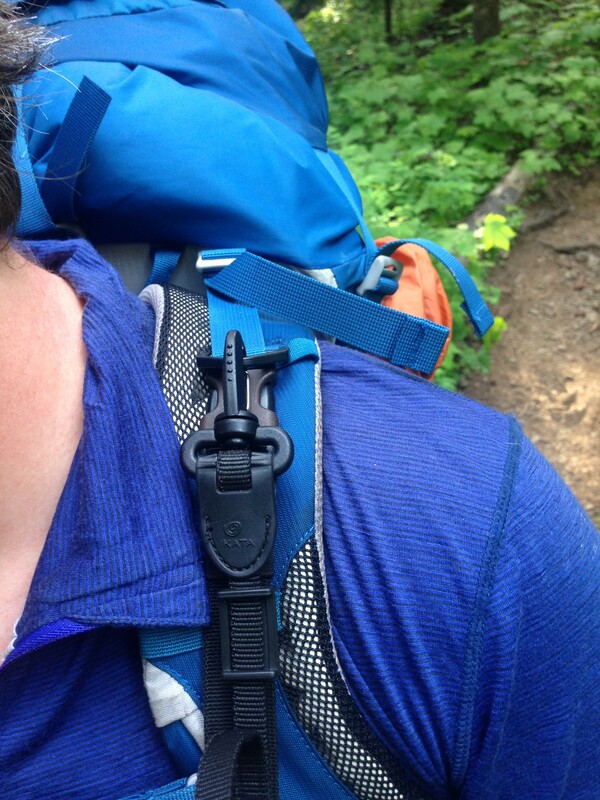 The newer Mountainsmith that comes close is the Swift FX which includes a lumbar strap. That adds weight, but also adds more carrying options for day hikes. These lists could be endless as I choose what I’m bringing for each trip, but they can be boiled down into three general setups: the day hike, the single lens overnight, and the two lens overnight. I hike with my Lowepro PhotoSport. I generally bring my heavier zoom lens. Sometimes I bring a full tripod. I leave the telephoto lens behind. If I carry the GorillaPod, I leave it on my backpack. I bring one of the two telephoto lenses. I use the Mountainsmith chest pack. I use my camera bag as my daypack. I can carry the GorillaPod on the Mountainsmith for quick access or on my backpack to be out-of-the-way. So, here’s what it all comes down to. How do I carry all that gear and keep it accessible. On a day hike, this is not as much of an issue. The pack is light, and swinging it around, even while still walking, is no big deal. But on an overnight, only one solution has worked this far: wearing the gear on my front. Yes, I move through the backcountry with a baby bump between my chest and belly. And it is like my baby. With the gear right in front of me, I can access or protect my camera at will. I can switch lenses, change filters, and clean the camera. And all without taking my pack off. There are several ways to accomplish this, and I’ve tried them all. 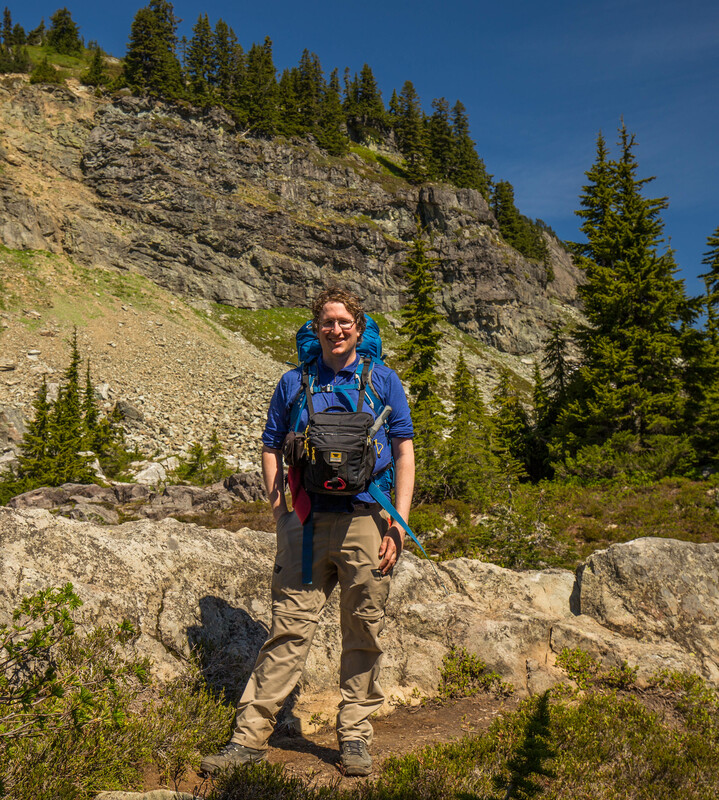 When I first started, I wore an uncomfortable harness underneath my backpack. It was awkward, but did have the advantage and disadvantage of leaving my camera bag on when I took my backpack off. But, I was always adjusting it, and it was never quite comfortable. But I got an idea from Kata which has since merged with Manfrotto. Their bags all had small D-Rings on them with they had a series of camera straps that were designed to clip to those rings. There are now more options for this kind of system, using buckles instead of clips, but I still prefer the clips. So, with their bags, I clipped the camera to my backpack instead of using an uncomfortable camera strap. What if I could do the same with my camera bag? Using straps and well placed buckles on my backpack, I was able to clip my Lowepro top loader directly to my backpack frame. This allows for a much more even distribution of weight that was far more comfortable. The trick came with finding the right sized buckles to fit my Mountainsmith pack, which had buckles already sewn on. This required some research and a search on eBay (thanks to my knowledge of buckles from my family’s injection molding company). Once I had the right buckles, it came down to placement. Different packs are different, and someday I may see buckles into my pack for an even better fit, but generally speaking the stabilizer straps are a good place to throw the top buckles (and the D-rings for slipping the camera body). Then the side compressions straps work well for at least one, or two side attachments. I use only one on my Toploader 55, just to keep it from swinging into my face when I bend down, but I use both sides on my Mountainsmith for added stability. After a bit of redirecting of webbing, voila! I had a seamless system that attached camera pack to backpack and allowed me to access gear on the trail. I’ve been using this system for over five years now and have been very happy with it. At times, the pack on front gets annoying (particularly when seeing my feet would be useful or when bouldering through tricky spots), but as of yet, I haven’t found a pack to match. However, there are other options if the idea of a chest pack doesn’t appeal to you. Think Tank has a slightly different approach to the same idea Kata originally came up with. But instead of a detachable padded section, Think Tank Camera Straps clips on clips on their camera strap. Photographer and Videographer Mike Wilkinson uses the Think Tank Camera Straps to keep is camera ready to go. Update: Jake has since moved away from the heavy DSLR setup he previous used and now hikes with the lighter Panasonic Lumix DMC-FZ1000. You can read more about this transition on his blog. I have oft contemplated that camera and it’s two current competitors: the Sony Cybershop RX10 and the newer Canon Powershot G3X. It’s an attractive bundle to have all that range in such a small and light package. He still uses pretty much the same method to secure it while backpacking. 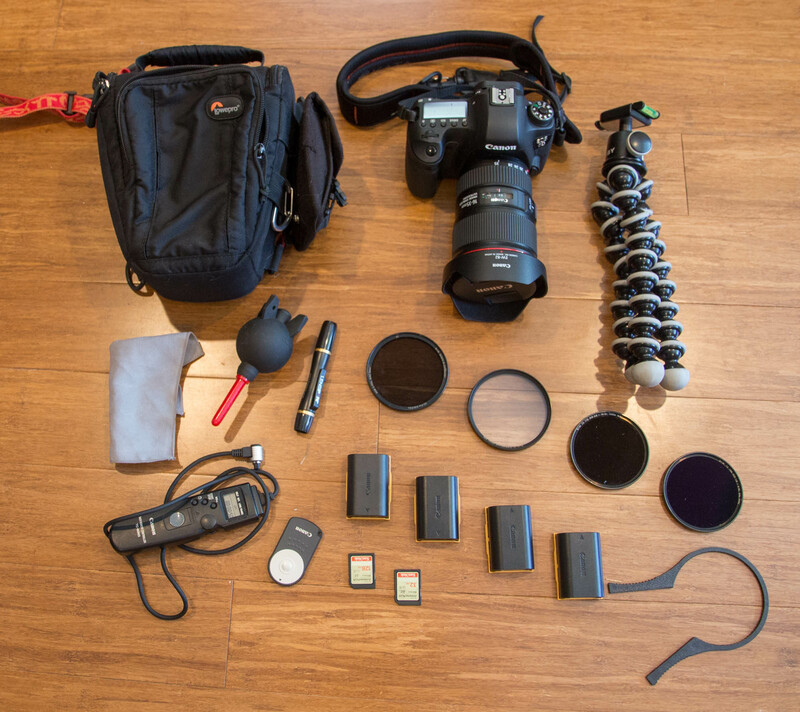 Jake Bramante from Hike 734 uses a very similar setup to mine, combining the Think Tank Camera Straps and ThinkTank’s heavy holster packs. He carries different gear than me (primarily a f/2.8 telephoto lens with 2X extender attached), so my setup would not quite work for him. Likewise, that camera bag looks bulky and heavy and unnecessary for my smaller lenses. I also have not run into the problem he encounters with the Atmos 50’s frame collapsing when I load it with my gear, however, my small frame Osprey Atmos 50 does not have a tall enough frame to get a 45 degree angle on the stabilizer straps. When the combined weight of the pack and the camera bag tip over the 40-lb mark, the minimal stabilizers don’t have enough angle to keep the weight off my shoulders. Under 40 lbs, things usually work out well, which matches the weight range listed in Osprey’s Atmos User Manual. It’s also critical to weight the straps accordingly. I have a tendency to pull my load lifters too tight, pinching the shoulder straps. When I feel pressure on my shoulders, I have to loosen the load lifters and re-tighten them. You want to bring them just to the point where you feel pressure, but not further. I’d love to have side holsters, but those tend to get in the way of my arms. Brandon Wehman has a clever DIY side holster trick, but I’m not crazy about the bag bouncing against my leg with every step. My dream side holster would be securely attached to a side strap or the backpack itself, but stay out of the way of my arms. Mindshift Gear had a great idea: to have a separate compartment in the bottom of your pack that swings around when you need it. Unfortunately, as of yet, their packs weigh quite a bit more than my light Osprey Atmos and Mountainsmith combined and have far less capacity. Too little for the longer trips I take. And whenever I’m not hiking with my Osprey, I miss the Airspeed mesh back. But that doesn’t stop me gazing longingly at the beautiful Mindshift slide arounds, and I’ve kept my eye on their day packs. If you’re not carrying the camera within reach, the next option is to carry it in an accessible pocket. In addition to the Think Tank straps, Mike Wilkinson also uses a LowePro Rover Pro series pack to store and access gear he’s not using at that moment. You can also use the lid pocket on your pack or attached holsters and lens cases to the sides of your pack for easy access when it’s not on you or if you have a buddy. This can be okay if you have lenses and gear that you won’t use until camp or stop for breaks (i.e. a low light lens, an ultra wide angle), but if wildlife stops by, getting your pack off will scare it off. And if not, the time to get your gear out may have lost you the money shot. And, if it’s in my pack, I’m less likely to stop and take a picture. If you’re a little over crazy with the photos, maybe that’s a good thing, but I haven’t gotten past my shutter addiction yet…. What about you? what solutions have you tried? Have they worked? Why or why not? Take a moment and share your thoughts in the comments below. Hello Jon! This is Jake with Hike 734 and I’ve since upgraded (or downgraded?) my camera setup so that I don’t kill myself hiking a bunch and blogging. I sprung for the Panasonic DMC-FZ1000 which brought my weight from over 9 lbs to a shade over 2 lbs. With that camera, there are definite sacrifices (and a few upgrades), but it allows me to hike without carrying around too much gear. It looks like Canon is coming out with another similar camera with a built in lens and a 1″ sensor. I found myself not wanting to bring my kit along when I hiked, but hated when I didn’t This has given me a happy medium. Anyway, my new setup with this camera is still using the top straps of the ThinkTank Photo backpack connection kit and a cheap case logic bag with D-rings to carry my camera. You can see the new camera here https://www.hike734.com/practical/hiking-with-the-panasonic-fz1000/ which gives a quick overview of it and compares it to my 7D setup. I’d love to hear more about your DIY strap setup if at all possible! Yes, I saw your post about the upgrade, and I’ve been contemplating a lighter setup a well for a while. I struggle with the sacrifices I would make, and I haven’t settled on anything yet. I’ve toyed with going to a mirrorless setup—an Olympus, Panasonic, or Fujifilm system would save somewhere between two and three pounds. And I’ve definitely eyed the Sony RX10 and Panasonic DMC-FX1000 and more recently the Canon G3X. I find myself using the 16mm end of my wide angle lens a lot though, so it’s hard to consider backing up to 24mm. And, of course, there’s nothing like the dynamic range and image quality of a full frame. It’s a hard thing to balance and a struggle I’m still going through. How have you found it for getting good shots of wildlife? Is it responsive enough to get the shots quickly? There is definitely a part of me that would love to only carry around a small camera like that while still having the range to capture good wildlife. But, I have recently made one upgrade that has made carrying the full kit a little less burdensome. I bought a new pack recently, the new Gregory Baltoro 65. Instead of bringing the larger camera bag, I now bring only my smaller top loader because the Baltoro has two pockets on the top, one of which is a perfect fit for my telephoto lens. The pack is heavier, but it handles larger weights much better, and that top pocket saves about a pound by not having to bring the larger camera pack. I still need to write an update post on that new setup. As for my custom straps, I use the Pro Light Camera Straps formerly made by Kata Bags which has now been incorporated into Manfrotto. The straps have small clips that attache to a cushioned should strap or can be clipped directly to your pack. There are other similar straps that use buckles instead of clips, though I find the clips to be a nice differentiator from the buckles that I use to clip my camera bag. You can see the setup in the picture above. Essentially I added a buckle I bought off eBay (to match the larger camera bag) and a plastic pice with a hole bought from REI and looped them onto the load stabilizers, much like the ThinkTank. I took some old straps I had with buckles already on them and looped them around the D-Rings on the camera bag, though you could also connect clips to the end of those instead. I just used what I already had. I then attach a buckle to each side of my hip belt or lower on my pack, depending on where makes the most, to stabilize and keep it from hitting me in the face when I bend over. For the smaller bag, I generally only clip one side. For the bigger bag I clip both. It makes it fairly easy to clip and unclip the camera bag from the rest of my pack. I have also jerry rigged a strap with buckles on both end so that I can attach it to the camera bags and use the camera bag as a side bag on day hikes.